As you might imagine, I don't have a full TV production studio at my disposal making these videos - its just me, my desk, some bits of white board, some cheap LED lights my iPhone and my iMac. For editing, I use the excellent (and excellently FREE) iMove by Apple, which for standard editing (cutting, transitions, captions etc) is really easy to use and does the job really well. But it also has a few basic special effects feature in it, which I'm trying to make use of were I can. Nothing advanced of course - the tools are very basic, but you can do a lot with them if you use some imagination. As an approximate indicator of the level of SFX at my fingertips, I'd say about the same level of Doctor Who in the late 1970s - early 1980s. I could so laser effects for example - but the holder of the laser gun would have to not move, or the laser beam would appear to stay in one place whilst the gun waved around it. But another tool in iMove is Chroma Key - more commonly knows as Blue or Green Screening. This is where you shoot something in front of a plain blue or green background, and then overlay that video over another regular piece of video (a background). 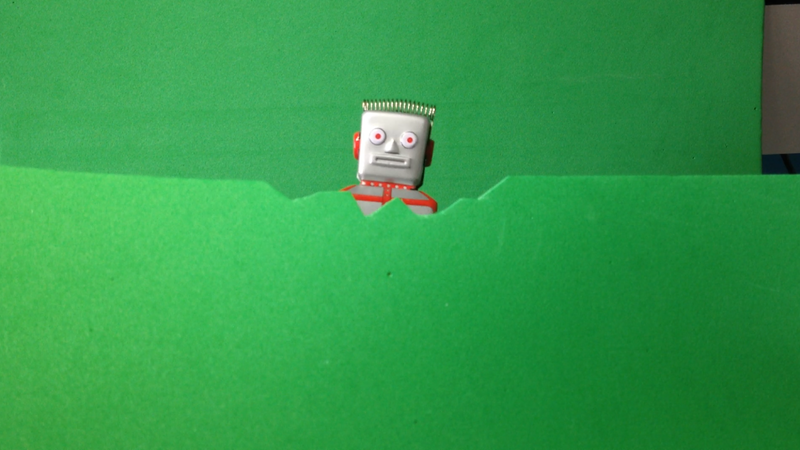 Using the computer, anything blue or green is then digitally removed, leaving a masked element that appears to be part of the background video. Using this you can get some great effects - but to get premium quality chroma key, you need a proper green or blue background and have it properly lit. If not, the masking effect can be a bit rough, and give the effect a 'cheap' or 'tacky' feel. But as 90% of the items in my collection are retro and have that 'tacky' vibe, then this style suits me perfectly. 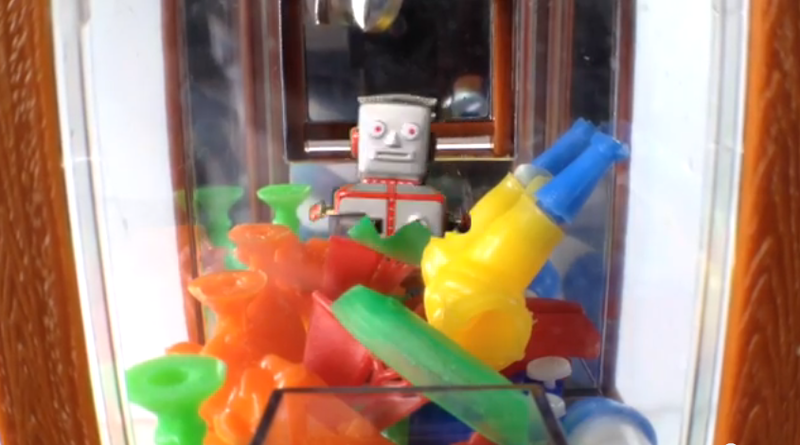 So for the Prize-o-Matic video, I wanted to show Colin the robot seemingly trapped inside the arcade cabinet - and green screen seemed the perfect way to do this. I bought a selection of bright blue and green card and craft foam sheets and gave it a go. I'd already shot the background video (a closeup of the miniature arcade cabinet) so all I needed was the shot of Colin flailing about. I ended up using the craft foam sheet, as it was easy to cut, prop-up and handle during shooting. Seen here you can see the shot before editing - in iMove you can also crop out unwanted areas (which has been a god send) so the area top right wasn't seen. Im holding both colin and the front piece of green foam sheet here. It ended up working pretty well - in iMove you can also tighten up the green screen effect by 'erasing' an other parts that aren't being masked that well - usually a slightly different shade of the green, or a shadow. Shown below is a grab of the finished shot - when you watch it, it looks like a really retro bad special effect, but I really like that - and I love having my hands tied by limited technology. Makes me feel like Im having to be creative to get results, rather than just installing an effects plug-in for my software and having it do it all for me. Anyway, I'll be using it quite a bit in video to come!